The software is described below, arranged by the Ribbon group in which they appear. If you have many opened Excel workbooks then it will be difficult to navigate between, this utility will help you to navigate through your workbooks easily and also to a certain worksheet inside the workbook by elegant way. If you are tired of removing duplicated rows, or loaded by comparing sheets, or having headache doing complicated tasks in Excel, then Dose for Excel is the powerful handy tool for you to simplify all these complicated tasks into few clicks. It provides more than +100 advanced new functions and features added into Excel ribbon for your easy use. 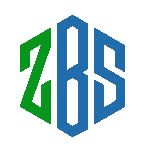 For example, you can export sheets quickly, merge cells or rows or columns without losing data, comments assistant, count cells by color, advanced built-in formulas, advanced built-in functions, auto backup your workbooks easily. 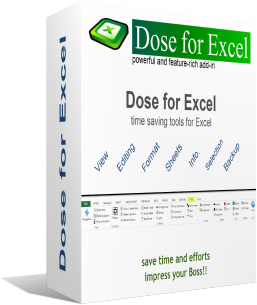 Dose for Excel simply will save your time and effort. A selection tools that makes any type of selection easier in Excel. Easily select cells by using this feature even though there are blank cells or rows or columns then this utility will select all used range. Easily extend the selection to the last used row even there are empty cells or rows. Easily extend the selection to the last used column even there are empty cells or columns. Select a range of cells and click on "Select Merged Cells" and all merged cells will be selected. You can easily select a specific rows or columns at an interval you set. For example, you can select 5 rows every 2 rows interval. Select cells that meet a certain criteria you set. Once selected, you can perform other operations like (delete, format, etc...) to the selected cells. A collection of insert tools that helps you insert anything such like date, option buttons, random,etc... with one click. Easily insert title row for each interval of rows you specify in a selected range. Easily insert empty rows or columns as much as you want at any interval with one click. Randomly generate numbers, string, date, Boolean(TRUE/FALSE, YES/NO), or custom list you specify. This is mostly used when you want to test a formula and needs some data to be in cells to test on. Save time by using date picker to insert date into cells by picking the date from calendar, also you can set it's format. Fill blank cells in a selected range with values above, right, left or below. Also you can fill with fixed or linear values. This utility can insert check boxes in the selected cells with one click. If there are text in cells then it will insert the check boxes and assign the cells text to check boxes captions. This utility can insert option buttons in the selected cells with one click. If there are text in cells then it will insert the option buttons and assign the cells text to option buttons captions. Delete anything starting from rows or columns with certain criteria (Identical, hidden, empty, etc...), objects, check boxes, option buttons, macros. Delete or highlight (empty rows, rows of at least one empty cell, rows that contains, identical rows, hidden rows). Delete (empty columns, columns of at least one empty cell, columns that contains, identical columns, hidden columns). Quickly delete any type of illustrations or objects such like charts, pictures, smart arts, lines, auto shapes, text boxes, etc.. from current sheet or selected sheets or all sheets. If you have many check boxes in your Excel worksheet, then you can use this utility to batch delete check boxes from selected cells. If you have many check boxes in your Excel worksheet, then you can use this utility to batch delete option buttons from selected cells. Remove all macro, user forms, VBA modules from your Excel workbook with one click. Handle text in your Excel sheets easily and quickly using this collection of text tools. Insert values in cells before first character or after last character, or specify the positions to insert, or insert according to letters case, or serialized selected cells (1-,2-,3-,etc...) easily with one click. Remove spaces from cells like leading spaces(at the beginning of cells), trailing spaces(at the beginning of cells), all spaces, extra spaces(convert more than 2 spaces into one space). Using this utility, you can remove the number of characters you want from left of text or remove characters from right of text or even specifying a position to start removing characters from any text. Remove only characters or only numbers or remove all except characters and numbers from selected cells easily with one click. Change letters to upper case, lower case, proper case or capitalize each cell. Reverse text order in many ways, reverse all characters of text, or reverse words separated by space, or reverse words separated by comma, or reverse text using any separator you specify. Split first and last names, or split cell by separator you specify with one click. Merge cells values into one cell, or merge rows into one row, or merge columns into one column easily with ability to use separator. 1- Toggle show or hide comments with a single click. 2- Convert comments to cells text. 3- Convert cells text to comments. 4- Easily delete comments in a range of cells. 5- Resize and position comments of selected cells. 6- Collect comments on all sheets and list them in one sheet column. 7- Replace comments old value with new one. Write or convert currency or number into words whether in dollar or any currency you choose with one click. Advanced filter gives you the ability to select a cell value and just press on filter to filter on this value easily. Shade or color every other row or column with conditional or standard formatting easily with one click for the selected range in Excel. Ability to remove all conditional formatting and background colors from the selected range with one click. buttons as much as you want that can be reuse in all excel files at any time. 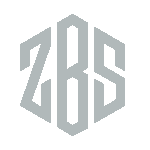 2- Cell format includes (back-color, fore-color, borders, text alignment, font size, font bold, font underline, font strikeout, font name). Color all same duplicated values with same color, example: cells that contain 'Hello World' will be colored with red, cells that contain ' Microsoft Excel' will be colored with yellow and so on. This utility will do the math of count, max, min, average for cells according to their standard or conditional formatting colors or font color, each color will be grouped in a row. Export your workbook sheets into separated workbooks, each sheet in its own workbook. Ability to check the worksheets you want to export and set the destination. List all worksheets of active workbook in one sheet as hyperlinks to easily navigate to them. If you have a lot of sheets in one workbook, then this utility will be so useful to delete all empty sheets with one click. Sort all sheets alphanumerically whether ascending or descending, or even if sheets names are date. Count all visible and invisible sheets in active workbook. Count all words in selected cells easily with one click. Count all characters in selected cells easily with one click. Set this feature to auto backup your workbooks when opened or on demand or set it to off, option to set the destination of backup directory. Change settings of Dose for Excel, example: change the po-pup position of the features panes from left or right, also you can set option that takes a copy of the sheet before using any feature or utility of Dose for Excel. formula, and you don't need to remember how to create the formula. function, and you don't need to write code for it or formula. convert numbers stored as text to actual numbers, and convert numbers to text values. Compare sheets peer to peer or based on column easily to save you time from comparing them manually or using formulas. The changes of updated, removed, new rows and cells will be highlighted each in different color. Also comments will be inserted to show the old value of each updated cell. Convert your Excel workbook to Full Screen for easy reading, it will minimize the ribbon, status bar and formula bar. Option to show them again and return the workbook to the first show state. If you have a huge data with a lot of rows and columns at your workbook then this utility will make you view your data easily by highlighting the column and row of the selected cell. View a row that has too much columns in a new window separated that includes 2 columns, one for headers and the other for row data.